Happy Thanksgiving to the MS Community from MSAA! Coming in a close second place were cards showing a puppy and a kitten, a candle centerpiece, and a festive candy turkey with two small pumpkins. Sadly, our determined and colorful turkey was also defeated, but we’re sure he at least ruffled a few feathers in the process! 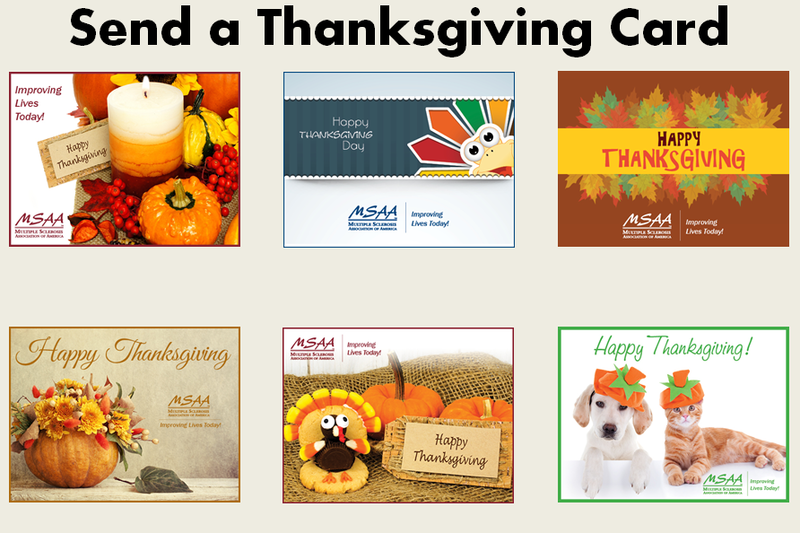 We would like to thank the more than 1,200 people who took part in this year’s fun election to select MSAA’s official Thanksgiving Card for 2014! MSAA’s winning online card “Pumpkin Floral Arrangement” is now available for you to select and send electronically to everyone you know. And since the other candidates received many votes as well, MSAA is offering all six cards for you to send! This is a great way to send Thanksgiving greetings, while showing your support of MSAA, a leading resource for the entire MS community, improving lives today through vital services and support. At this time of giving thanks, we also want to express our sincere gratitude to the many individuals who have so generously contributed to support our vital mission. Please note that MSAA’s offices are closed for the Thanksgiving holiday on Thursday, November 27th and Friday, November 28th. 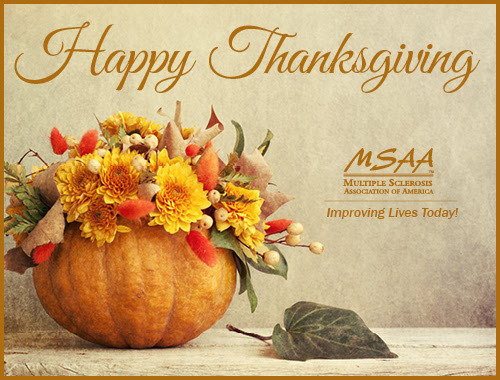 From all of us here at MSAA, please enjoy a safe and happy Thanksgiving! This entry was posted in MSAA Updates and tagged 2014, cards, ecards, family, friends, holiday, holiday hours, holidays, ms, msaa, multiple sclerosis, pumpkin, thanksgiving, turkey by MSAA. Bookmark the permalink.